Dark Politricks: Would we have had the financial crisis if women ran banks? Would we have had the financial crisis if women ran banks? Tom is obviously a Democrat and a liberal but in his last segment something he said I found quite interesting. "I hope we shall crush… in its birth the aristocracy of our moneyed corporations, which dare already to challenge our government to a trial of strength and bid defiance to the laws of our country." Thomas Jefferson obviously was aware of the dangers of unlimited corporation power, money and influence and it would be good if some of the Tea Party members who are so fond of the founding fathers actually read more of what they actually said about standing armies, corporations, a Federal bank and undue political influence by lobbyists. Tom Hartman then followed that up with other Presidential quotes throughout the ages all of which said that there was little need for people to earn so much money that it coultn't be spent in their lifetime. Not only does it prevent a true meritocracy from occurring - as huge amounts of wealth are passed down the family line like an aristocracy - the thing the founding fathers fought against in the American Revolution. But it leaves people with so much money that could be used for the good of the nation as a whole except many of these super rich people would rather pay no tax at all than do some good for their country. It also showed that high tax rates have no correspondence with job creation, productivity or industrial or technical innovation. 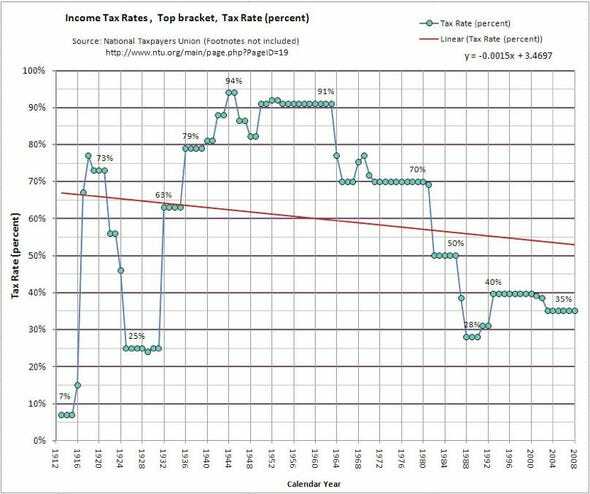 As you can see Tom's main point was that the top rate of tax has dropped from a whopping 94% in the mid 1940's, to 70% during the 1970's and then its current position of 35% and this has no correspondence with the high times of American society. It does however correspond with huge wealth inequality between the rich and poor. With the richest few percent getting richer and the middle classes basically staying the same. Tickle down economics doesn't seem to work too well it seems. During the 1950s and early 1960s, the top bracket income tax rate was over 90% and the economy, middle-class, and stock market boomed. The 1950's were a golden time in American society where there were plenty of jobs, houses, affordable education and guess what - the richest few percent (those job creators) didn't up sticks and leave America to another country with lower tax rates. They stayed and paid their taxes. He also talked about a study that showed that once a person is earning enough money to cover all their basic needs e.g housing, food, travel, clothing etc then earning more money does NOT make them happier. This reminds me of learning about Maslows hierarchy of needs at college. Once you have all your basics covered, maybe married or in a relationship and doing a job you like or maybe other activities that fulfill your life then your pyramid of needs are satisfied. The question then becomes what happens to all those people who have so much money that there is nothing left on earth to do with it. I am talking about people who earn billions of dollars, fly around in private jets, own multiple huge boats and have garages full of the latest Ferrari's and Porches. They may play golf all day or do other hobbies but I reckon there is another need that is missing from the pyramid that only comes when all the others are fulfilled and the person has enough money to achieve or attempt to achieve it plus a certain character trait that is the opposite of altruism - a hunger for power. Some people are born alpha dogs, others aren't. Some people in the old days where physical power was all that mattered would have been battered to the floor and trod over like a carpet (people like Bill Gates or the Koch Brothers for instance). Today things are different and money (lots of it) equals power or the ability to achieve it through various means. This might mean running a huge global corporation or the attempted ownership of countries and even blocks of them (i.e. the EU). This is what many people believe the Citizens United Ruling has allowed to occur with the super rich trying to "buy" the Presidency through their use of Super Pacs, and huge financial donations. Whereas Obama is having to rely on lots of small donations and seems to have lost out on those big money givers he had last time around Mitt Romney only needs to attend a couple of functions with the Koch Brothers and he walks away with a few hundred million dollar bills in his pocket. "Well I have more money than I can ever spend in my lifetime. Or leave to my children who will just end up spolit entitled brats who probably won't do a day's work in their lives. With all this money I will do something good for my country and leave a lasting legacy like the Victorian Philantrophists and I don't mind taking a hit on my immense fortune by opening factories and other businesses in the USA and pay the taxes and benefits that come with creating jobs in my country." "Yes it might cost more than off-shoring all my labour and manufacturing to China or India but as I have more money than I could possibly spend it makes no difference to me if I have to pay slightly more in wages or health benefits if it means that it brings jobs back to desolate American towns like Detroit or New Orleans." People with huge amounts of wealth could do immense amounts of good to the people of the earth and I am sure lots of them exist but when the ultimate pyramid slice at the top of Maslows Hierarchy becomes "ultimate power" you end up with Koch Brothers buying Presidencies, Bilderberg, Bohemian Grove and huge experimental projects that are doomed to failure like the Euro. You also end up with Banksters who have so much money that the only joy they get out of life is making billion dollar gambles with pension funds on the stock market, derivative overloads and the fixing of Libor interest rates. All of which have unintended consequences that affect whole countries and even the world as we are currently experiencing. You are either this kind of person or you may have an altruistic personality, probably non alpha males, who chose to spend their money on charitable organisations. Building schools and hospitals in under privileged areas and all the sort of things that leave a lasting legacy once they are gone from this earth apart from a mention in a Wikipedia article as one of the banksters who was complicit in the great financial meltdown of 2008. This leads me to another interesting point in which an ex female banker appeared on the "This Week" programme last Thursday in which she said that due to the "alpha male" culture of bankers in the City of London there was more risk taking and therefore potential for disaster. If women ran banks and trading floors she reckoned the financial crisis probably would never have happened in the first place. Please call Obama a Dictator not a Socialist! How will voting for Mitt Romney help America?